After parting ways with friend and fellow colleague Maria Grazia Chiuri (who is now at Dior), Pierpaolo Piccioli was left alone to create the next Valentino and Red Valentino collections, among which one of the first ones to be unveiled is the Red Valentino pre-fall 2017 collection. 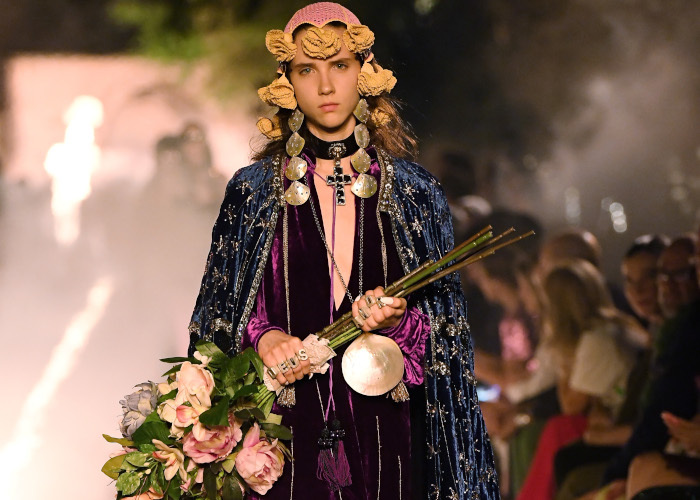 Back in September, Piccioli had the chance to show the world his very first standalone take on Valentino, releasing the Valentino spring/summer 2017 line-up that overall received positive feedback and comments. Now that we finally have a first glimpse of what kind of direction Piccioli is taking for Valentino’s sister line Red Valentino as well, things couldn’t be more exciting. For his Red Valentino pre-fall 2017 collection, Piccioli focused on both the Sixties and the Seventies, embodying their main motifs and patterns in their most bon ton ways. He also included philosophical accents to the collection, focusing on the ones behind the construction of the iconic Chelsea Hotel in New York. “I love the idea of the Chelsea Hotel, the late ’60s and ’70s of course, but also its birth, the French philosopher [Charles Fourier], and his utopian dream of people living all together,’ he told Vogue. Originally meant to become a utopian community based on the works of Charles Fourier, the Chelsea Hotel was designed by architect Philip Huber and then built in New York between 1883 and 1885, quickly becoming the place many artists, musicians and writers in the Twentieth Century called home. Just to give some examples, it was the home to poets Allen Ginsberg and Gregory Corso, as well as the place where Narcy Spungen, namely Sid Vicious’ girlfriend, was found stabbed. Mysterious and surely charming, although now closed for reservations, the Chelsea Hotel keeps on inspiring artists for their creations, with Pierpaolo Piccioli being one of them. Like most of the artists who created their masterpieces while living at the Chelsea Hotel, Piccioli also got stuck into the hotel’s capturing creative vibes, which in return urged him to translate them to a 34-piece collection that is nothing but dreamy and otherworldly. With the Chelsea Hotel being home of many artists from the Sixties and Seventies, he focused on the main motifs such artists channeled while staying there, namely mannish suits inspired by, among others, Patti Smith, airy and floral detailing as worn by Janis Joplin, and revisited glam rock dresses inspired by punk rock artist Sid Vicious. This Red Valentino pre-fall 2017 collection alternates ultra delicate and elegant shirts in tulle with edgier leather jackets and super short little black dresses, interrupting such motifs with hippie-approved floral palazzo pants, midi skirts with botanical prints and even floral crowns. The collection’s color palette follows similar themes, too, with black colors dominating the scene along with pastel hues that, ironically, remind of another hotel, namely Wes Anderson’s Grand Budapest Hotel. Given the fact that Piccioli will showcase his Valentino fall 2017 collection in New York in January, should we expect more New York-inspired vibes at Valentino? On these premises, we hope so!